In 2013, the European Union launched the Human Brain Project (HBP) with an ambitious goal: to develop artificial intelligence (AI) capable of one exaFLOPS within the next ten years. One exaFLOPS corresponds to a billion billion or 10 to the power of 18 calculations per second, more than the number of stars in the Milky Way and the Andromeda Galaxy put together. Everybody human being is born with a compact version of just such a computer, our brain. The HBP is hoping to achieve with AI in just ten years what has taken evolution billions of years. Over one hundred research institutions and companies are involved in this large-scale project. The first step was to set up an international research network so neuroscientists, computer scientists and other specialists from different disciplines could exchange information and ideas. Together, they are investigating the human brain in greater detail than ever before – starting at the molecular level all the way up to the connections that enable complex cognitive processes. Philosophers are on board as well, as this research touches on ethical issues. Cooperation on this ambitious scale can only run smoothly if exchange inside the scientific community improves. To date, there are no international standards for neurological research and each organization structures their findings differently, making is hard to capture the current state of research in one unified model. HBP hopes to change this, and will allow researchers from all over the world to access the project’s findings for use in their own projects. The plan is to establish an international platform that processes neuroscientific data uniformly, so that knowledge generated could also be used for medical research, for example. While HBP scientists in Geneva investigate the structure of the brain, researchers in Munich are working on a robot that will imitate the full sophistication of the human body. Dubbed Roboy, this robot is not just the face of the HBP. It is also the arms and legs, ankles, the swinging hips and blinking eyes of the project, so to speak. 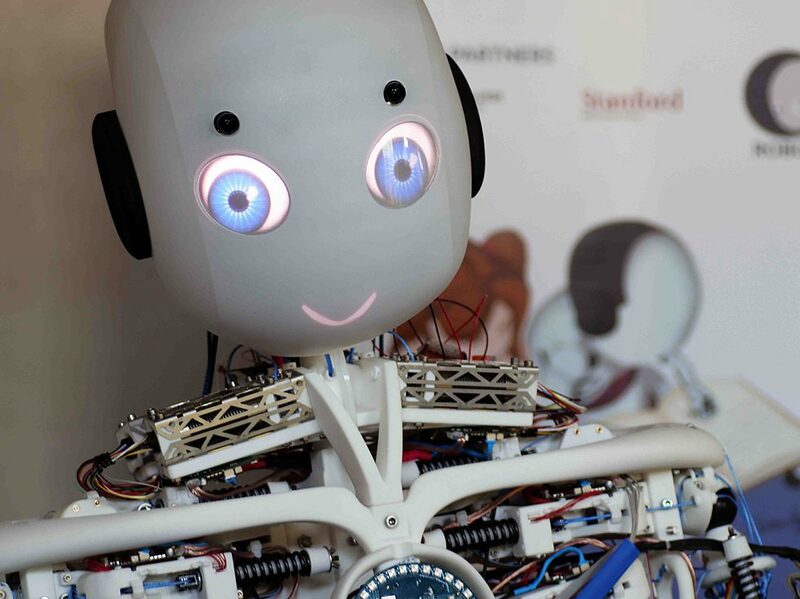 Roboy’s story began at the University of Zurich in 2013, where computer scientists, engineers and mechatronics engineers joined forces to develop a robot that could hold its own with human beings, at least on the technical playing field. Researchers from all over the Europe and even from far-away continents are on board, such as the University of Melbourne researchers who used their knowledge of muscle control to make a decisive contribution to the software that controls Roboy’s motor skills. In return, the Roboy team contributed high-quality hardware to their projects. The Roboy robot can ride a bicycle and operate a turntable. By 2020 its makers say it will be able to diagnose medical conditions. | Photo: © Roboy 2.0 – roboy.org The robot has since moved to the Technical University of Munich, where every semester a new team of students from various disciplines works to teach Roboy something new. Roboy’s skill set now includes things like the ability to talk two people at once or play the xylophone. All their findings are freely available on a robotics platform on the Internet. From the mechanics of its feet to the circuit diagram that allows Roboy’s eyes to see, the robot’s complete anatomy is explained on the open source portal and is available for download, so that any layperson, researcher or tech geek can add their own two cents to move the project forward. And the little robot is a fast learner: Roboy can ride a bike and operate a record player. When it grows up, it might have a promising career as a waiter or carpenter, jobs that require exceptionally versatile motor skills. By 2030, the HBP hopes to have reached its goal of designing a computer that can keep pace with the human brain. There are still a few hurdles to clear along the way though. It will take quite a few more technical steps to get to one exaFLOPS of computing power, for example. And as even coming close to simulating the speed and storage capacity of the human brain consumes a tremendous amount of energy, strides will have to be made in energy-efficient computing power. This could ultimately revolutionize traditional industry as well. If these hurdles can be overcome though, Roboy’s is looking at a very bright future: outfitted with HBP’s exaFLOPS “brain”, the robot would come closer to the capacity of a human being than any machine before it. This raises obvious and fundamental ethical questions, which is why an ethics committee has always been an integral part of the project. Roboy always personifies its “be friendly” motto, and its open, charming appearance encourages humans to interact with the unthreatening mechanical friend. Copyright: Goethe-Institut, Johannes Zeller. This work is licensed under a Creative Commons Attribution – Share Alike 3.0 Germany license.